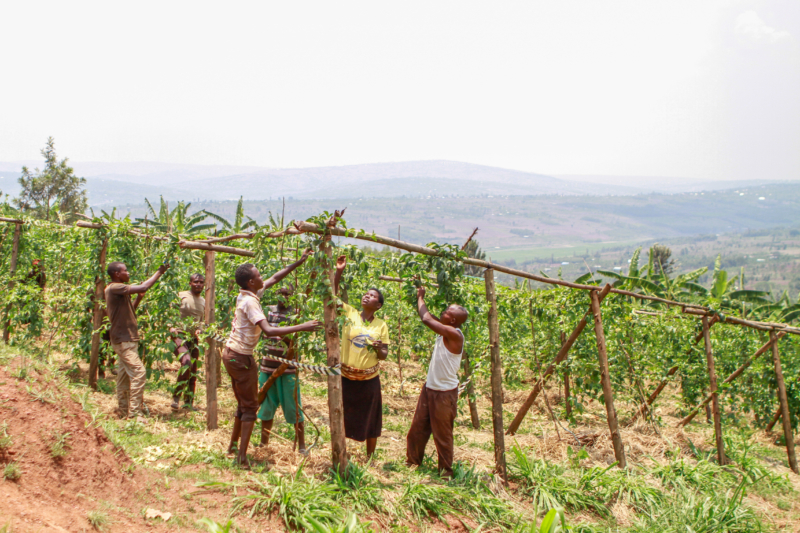 The project ‘TransFARMation: Empowering young people in rural Rwanda’ by the Rwandan NGO ‘Uyisenga Ni Manzi’ (UNM) aims to support marginalised and vulnerable young women and men to become successful agricultural entrepreneurs. The Lemonaid & ChariTea Foundation is supporting this project in the rural areas of the Eastern Province in Rwanda since December 2017. The Eastern Province of Rwanda is the largest and the most populous province of Rwanda. In its rural areas however, young people live in conditions where expectations are low and support for advancement is limited. In addition, 38 percent of the inhabitants of the Eastern Province live below the poverty line. One of the causes is the poor access to education. Only 14 percent go on to secondary school after having finished primary education. Furthermore, this is exacerbated by trauma. Lots of young people orphaned by the genocide and HIV/AIDS are not equipped with basic support networks from neighbours or the community. As a result, they lack technical knowledge and self-confidence. The NGO Uyisenga Ni Manzi (UNM) was founded in 2005 to address these problems. UNM is a locally registered non-governmental organisation based in Rwanda and has many years of experience in promoting comprehensive and psychosocial care. The provision of education and health programmes, legal protection and agricultural trainings serve as basis for income generation and livelihood development. Therefore the programmes of UNM enable vulnerable young women and men to build a life of independence and dignity for themselves, their families and the wider community. The NGO is successfully mobilizing young people to create peer groups, where they offer each other solidarity and mutual support. The objective of UNM is to provide assistance to the youth without making them dependent on the organization. It is about making them more independent and self-reliant in order to achieve sustainable change. The current project ‘TransFARMation: Empowering Young People in Rural Rwanda’, which began in late 2017, aims to offer young people a new perspective on agriculture as a competitive career choice in Rwanda. Even though 70 percent of young people already work in subsistence farming, agriculture is still considered to have low status and is associated with low income. Farming is therefore regarded as an ’employment of last resort’. 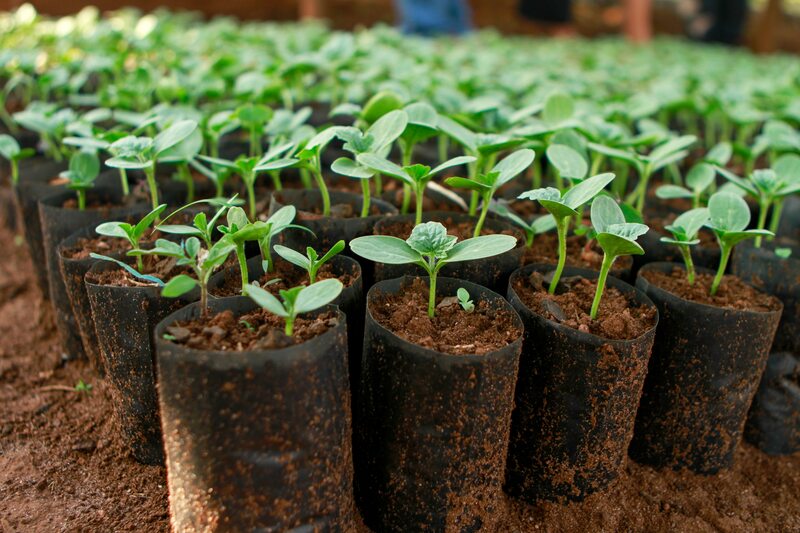 Nevertheless, Rwanda has advantageous growing conditions and a niche for horticultural crops, which represents a major contribution to the development of the country. The professionalization of agriculture can be seen as a way to use already existing skills in a more productive manner. Through the TransFARMation project the participants receive practical agronomic training, economic and financial courses as well as mentoring. The project aims to enable young people to increase their motivation and self-confidence, solve problems and identify new business opportunities within the agricultural sector. The project is implemented as a comprehensive 3-step model to empower young farmers and to educate them to become modern and successful agricultural entrepreneurs. The participants are subdivided into six cohorts of 170 people and are encouraged to develop profitable links to local markets as a cooperative. The project’s support lasts over three crop seasons. Within the innovative model the individual support and agricultural inputs for the participants gradually decreases within these 3 years. In the first year the groups receive training in agricultural and entrepreneurial basics, input costs for the first harvest and support from an agronomist. In the second year they have to bear 50 percent of the input costs themselves and in the third year only support in accessing markets and selling opportunities is provided. This model attempts to reduce dependence on the organisation and to convey independence as an integral part of the process. A “train the trainer” model complements this entire learning process. Once the project is completed, participants can continue to contact UNM for advice and support. Previous programmes showed that 73 percent of participants were able to increase their income by at least 60 percent. There have been many successes in the past three years, however in order to continue the programme further funding is needed. In cooperation with the Lemonaid & ChariTea Foundation the project is supporting more than 1000 young participants in the next three years. 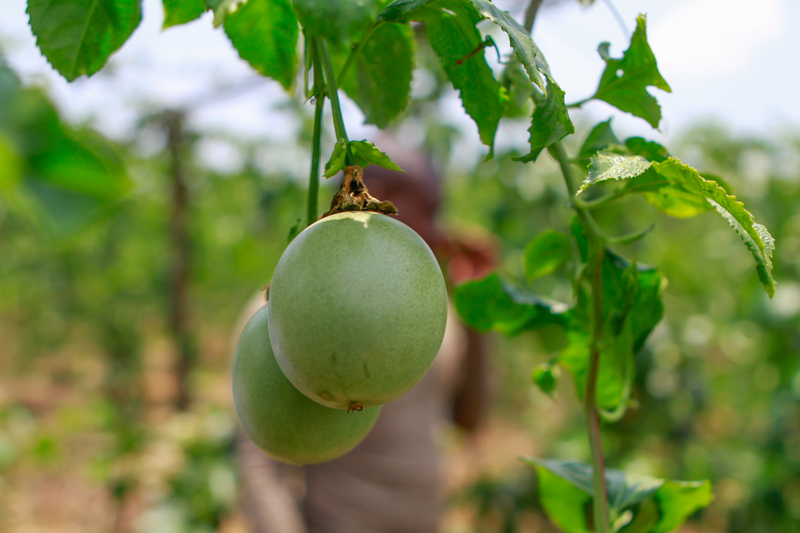 Through the TransFARMation project young people in the Eastern Province of Rwanda are becoming agricultural entrepreneurs and courageous leaders who overcome a resigned attitude and develop a sense of personal responsibility for their lives. It empowers participants to significantly increase their income, confidence and resilience. Additionally, the project offers a new perspective of agriculture as a competitive career choice for Rwandan young people and offers the consideration of commercial agriculture as an attractive and valuable livelihood option. Not yet ripe passion fruit.